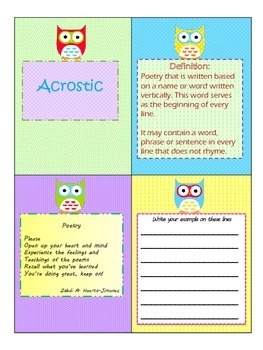 These cards are designed to learn, review, and practice poetry concepts. Have students play memory game utilizing the card with the name of the concept and the definition one. 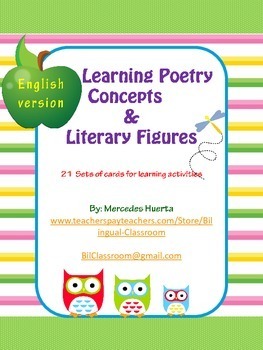 Another activity is to distribute the cards, previously shuffled, of concepts and examples to a small group of students.The objective is for the student to make a connection between the concept, the definition, and the example. Notice the difference of colors in the cars. 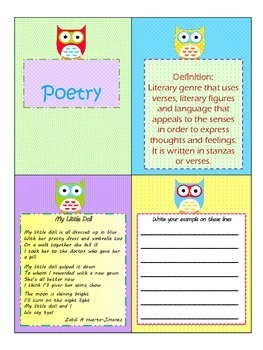 The first set corresponds to concepts directly related to poetry and the second set of cards correspond to literary figures.